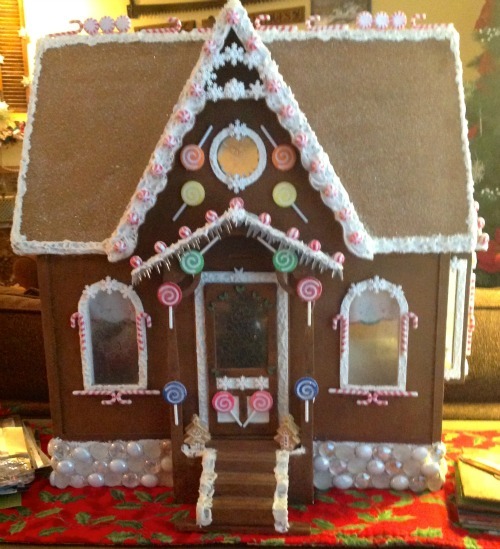 It is truly beginning to look a lot like Christmas! Each year I tell myself there is no need to add anything new to the large collection of holiday decorations I already have. Then inspiration strikes or I see something I would like to try and find a reason to create new decorations. This year I have a couple of new additions. I will also share some that have been around for a number of years and are family favorites. The newest are the holly painted white burlap runner and the square glass candle holder with holly & berry embellishments. NOTE: I also use handmade gifts from friends (the snowman) and a simple chalkboard to add more holiday flair. 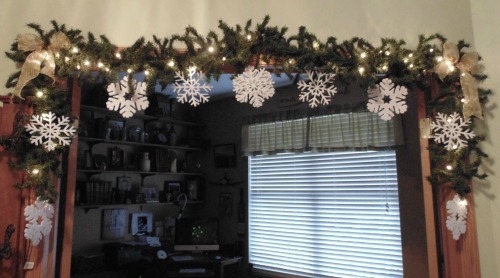 My holiday decorations always begin with lights. I have changed over to all clear lights. The bulbs can vary but the remain clear. 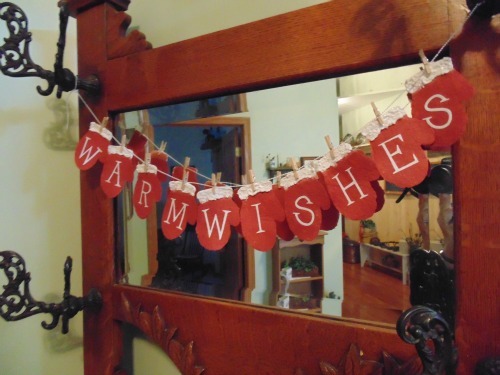 They are wrapped on garlands that are hung over doorways and windows or for stairway railings. 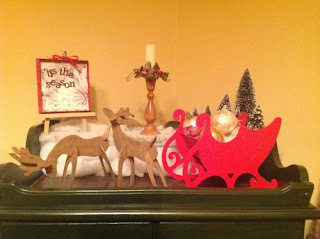 Handmade wooden reindeer, vintage glass ornaments in a vintage sleigh. 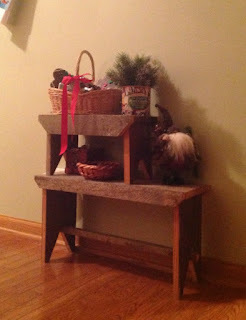 Handmade stacked benches hold a basket of vintage cookie cutters and other holiday-related items. An old slate board gets a special holiday message and simple, tiny brush trees add a holiday touch. I use elements that I already have as part of my decor and just add or change them up to show-off a holiday theme. A tiny mitten banner made from handmade paper hangs on a vintage coat rack in the front hall. A fabric and paper JOY banner on the guest room door. 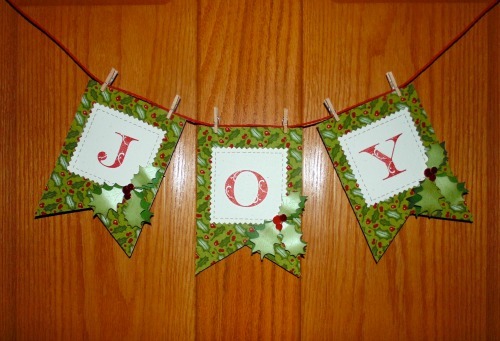 One of my favorite decorations to use around the house anytime are banners and during the Christmas holiday season they are definitely utilized. I have made several different kind through the years. Many are used at home and many have been given away. 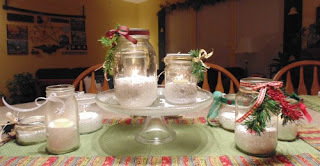 Here are candle jars made from an assortment of glass jars. 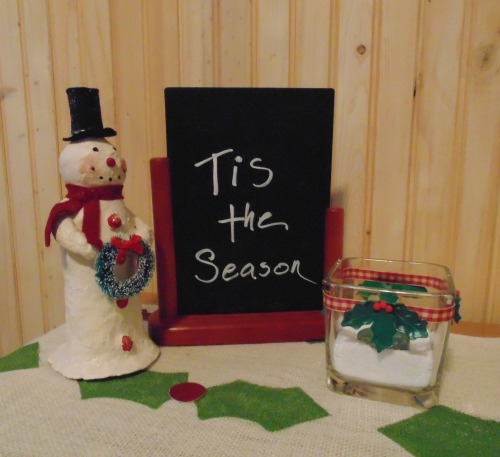 They can be used anywhere, alone or clustered together for a warm festive glow. I instructed a group of ladies from our community on how to create them and each one was so unique. I could go on and on with photos of handmade decorations that I made or received from others, but I end with one that was made several years ago from a small doll house kit. Thanks for stopping and leaving a comment! You're so good at doing that, I need to work on that. 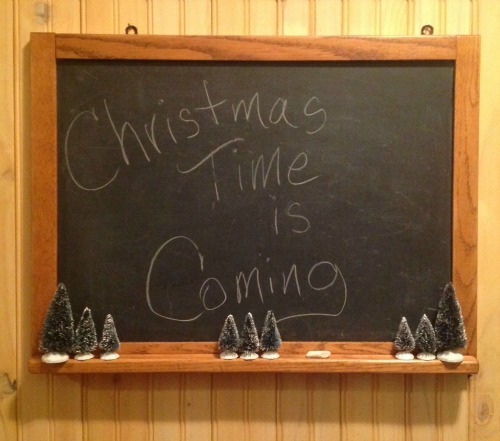 Aw, this makes me wish that Christmas was back! I adore those fireside banners!